Q-switched lasers are a special category of lasers that can deliver energy in extremely short bursts. As a result, this unique property makes it an ideal laser for treating pigment-related conditions such as freckles, sunspots, birthmarks and tattoos. The ultra short bursts of energy delivered by the laser disrupt the skin cells that contain the pigment, shattering the pigment/ink into the tiniest particles for the immune system to remove. Our state of the art laser machines use multiple wavelengths which work together to effectively remove the widest array of ink colours. For multi-coloured tattoos, you’ll find that different areas fade at varying degrees over the treatment time. 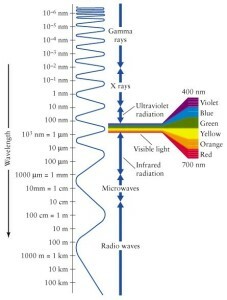 Each wavelength responds to different colours as colours are different wavelengths. Watch this video to find out why renude laser clinic is so effective at removing tattoos. How long does the removal process take? The laser session time for tattoo removal depends on the size of your tattoo. A small one can be as quick as 30 seconds. A sleeve, for example, could take approximately 20 minutes. How long will it take for my tattoo to be gone? For complete removal, most multi-coloured tattoos require at least 6 treatments, and the interval between treatments is generally 8 weeks with most other laser clinics. However, we will most likely be able to fast track you a 6 weekly visit cycle due to our innovative use of Low Level Laser Therapy (LLLT) as part of your pre and post treatment support, exclusive to renude laser tattoo removal clinics. Our cold laser stimulates your lymphatic system to move the broken-down ink particles through your body’s elimination pathways more rapidly, meaning that your tattoo will disappear more quickly. Factors that affect how quickly your tattoo will be gone. In the industry the time it takes for a tattoo to be completely gone is called tattoo clearance. There are many factors affecting how quickly your tattoo will clear – some, like choosing the right clinic, are within your control and others, like your skin type, are not. 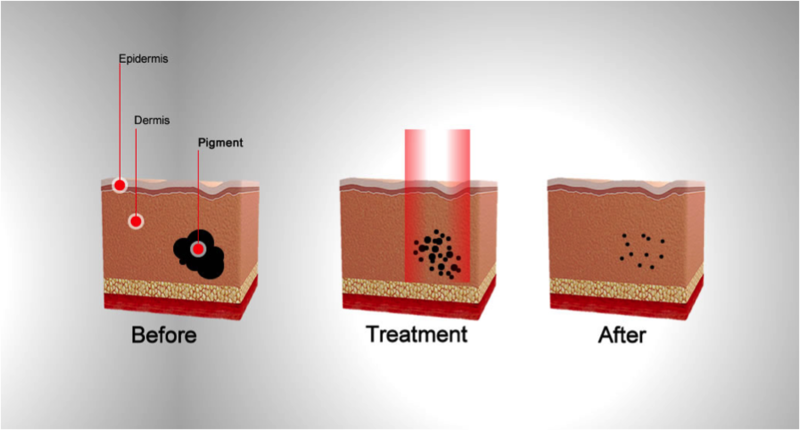 As laser is light, the darker your skin, the harder it is to remove some pigments, because darker skin actually means more skin pigment (melanin). Olive or Mediterranean skin is generally fine. Your clinician will advise you at your free initial consultation. As the removal of the fractured pigments is determined by the body’s lymphatic system , the further the tattoo is away from the heart (like your foot or hand), generally speaking, the harder it is to remove these pigments. These outlying areas generally require more treatments. To combat any potential effect that these outlying regions might have on clearance times for your tattoos, renude utilises cold laser during the tattoo removal treatment which will stimulate the lymph and improve the “cleaning” response effect. The head, neck and torso area respond most rapidly, followed by arms and legs, then feet and hands. 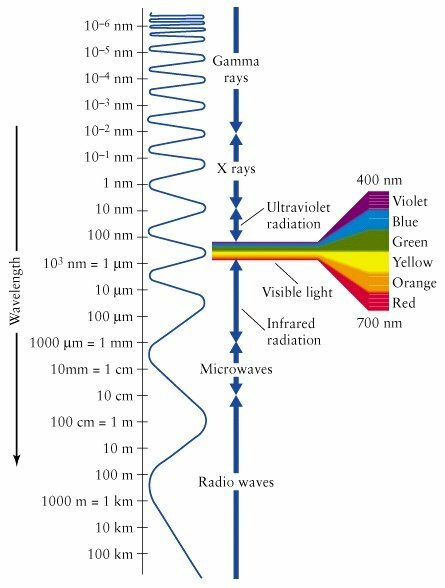 As you can see, our eyes are only sensitive to light which lies in a very small region of the electromagnetic spectrum labeled “visible light”. This “visible light” corresponds to a wavelength range of 400 – 700 nanometers (nm) and a color range of violet through red. 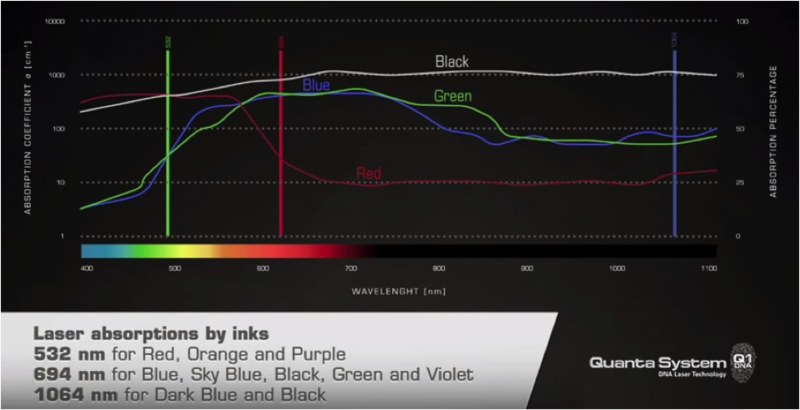 To receive effective laser tattoo removal, a laser machine with different wavelengths is required to ensure each of the different colours in a tattoo are able to be targetted. Our laser machines, Quanta Q-Plus C are the gold standard machine in the world of tattoo removal is because it is the only true 3 wavelength machine for all colour removal. The amount of ink used is also a contributing factor. When an old tattoo is reworked or hidden by another tattoo, the old tattoo pigments will sit at a deeper layer, meaning more treatments will be required. If there is any scarring of the skin where the tattoo is situated, then tattoo removal will be more difficult as the cells in scarred skin that is tattooed are harder to “break down”. The lymphatic system is a vast complex of thin vessels, valves, ducts and organs responsible for moving toxins and waste away from the cells to neutralise them and keep them healthy and functioning properly. As it is your lymphatic system that essentially removes the broken up pigments after your tattoo removal treatment, your overall state of health has a direct impact on how well your body will get rid of the tattoo ink. Luckily we have low level/cold laser at renude which assists your lymphatic system with this process. Toxins can include environmental pollutants, tattoo pigments, foods or the by-products of a normal metabolic function. Similar to the drain pipes in your house, it is definitely a good idea to keep the biggest drain, in your body (the lymph system) unclogged and functioning well. Renude’s Low Level Laser Therapy (LLLT) that is part of the cost of your overall treatment, helps to keep your lymph unclogged. 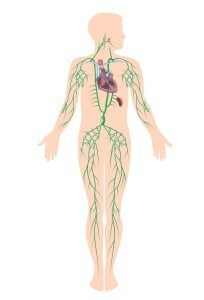 You can also support your lymphatic system during treatment by following our Tattoo Detox Program [link to sign up page]. The cost of removal is all dependent on the size of the tattoo. Please refer to our pricing page for an indication of some of the most common sizes. If you do not see your exact size tattoo, you should book in for a complimentary consultation and patch test that takes 30 minutes in total. The size of your tattoo and who created it will determine the number of treatments required. Professional tattoos often require you to revisit us 5 to 10 times whilst amateur tattoos can be as little as 1 to 3 times. During your free initial consultation, your renude clinician will inidcate the number of treatments required to achieve your desired outcome. If, after this number of treatments your tattoo is still visible, we will continue to provide laser tattoo removal treatments at no cost to you for a period of one year. We think superior knowledge, service and results are worth paying for when it comes to laser tattoo removal. If you have been quoted a cheaper price elsewhere where the treatment is peformed with a comparable Q-switched laser machine, we will happily match the written or quoted price. Pay upfront for the entire recommended treatment programme – for some people this might be hard to do especially if your tattoo is large. But we can arrange interest free finance to help you take advantage of our discounts. We also offer discounts if you want to have more than one tattoo removed at a time. Contact us to book your complimentary consultation and skin patch test. We accept cash, Visa, Mastercard and Eftpos. We do not accept American Express, Diners Club or cheques. We can also help arrange interest free finance for you. I’ve read a lot about Picosure and IPL lasers for tattoo removal. Why are yours better? 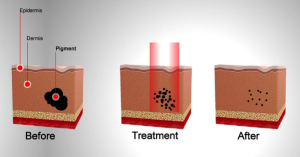 Picosure lasers only use one wavelength. This means that it is not 100% effective at removing all tattoo colours and it doesn’t fall into the black spectrum for full black pigment removal. This means that Picosure becomes even less effective as the tattoo fades because its laser cannot effectively detect the faded black pigment. That is why you will see many laser clinics offering what seem like great guarantees such as: “if we don’t remove your tattoo in 6 sessions, you can unlimited free treatments.” But many tattoo removal clinics NEED these types of guarantees because their lasers are extremely ineffective so you HAVE to come back time and time again. IPL (Intense Pulsed Light) lasers generate heat and will burn and scar the skin. It operates in milliseconds (instead of nanoseconds which is much quicker) exposing your skin to greater heat and discomfort. The wavelength of IPL is too broad to be effective in altering tattoo pigments. IPL lasers shoot a block of light whereas Q-switched lasers we use at renude, emit minute beams of light in the size of pin prick. Here is an image of a wavelength graph demonstrating why Picosure does not work well as well as an article on the dreadful scarring outcomes of IPL. What about tattoo removal creams? Tattoo removal creams do not work. The ink of a tattoo (especially tattoos designed by a professional tattoo artist) sits deep in the dermal layer of the skin which is beyond the reach of any standard cream. Any acid creams that could penetrate the skin deeply enough are likely to create damage through scarring. The other thing to consider is that creams contain ingredients that are toxic for your body. Why would you want to load your body up with unhealthy ingredients floating around you blood stream? You ideally want to keep your body as clean and healthy as possible so that your lymphatic or immune system can effectively carry away the shattered ink particles and remove them through your body’s elimination pathways. The pain has been likened to being flicked by a rubber band. During treatment, a cooling system will be used to cool and numb the skin. Anaesthetic cream can also be used onto the treatment area prior to laser tattoo removal. However, renude laser clinics are the only tattoo removal clinics to include the use of cold laser prior to treatment. The benefit of using cold laser on the area to be treated is that it will significantly modulate your perception of pain. Cold Laser has been effectively used worldwide for some time, to modulate pain syndromes. Renude believes this is a world’s first treatment with tattoo removal and are we are proud to be offering these highly effective therapies as part of your pre and post treatment for laser tattoo removal at no extra cost. Is there a risk of scarring with laser tattoo removal? The risk of scarring itself is very small. Our priority at renude is your health and providing you with the highest quality care and best possible outcomes. The Quanta Q-Plus C System does not typically leave scars due to its flat beam technology. It one of the most advanced laser tattoo machines available today. It is critical however that you follow the post-treatment instructions provided to you by your renude clinician to ensure the treated area does not become infected. As part of your treatment you will receive the cold/low level laser therapy as part of post treatment healing 2 days after your tattoo removal to prevent infection and improve tissue repair. Our experience and care ensures that any potential risks are eliminated or minimised. The patch test we conduct at your initial consultation and our follow up within a couple of days, will ensure the best possible laser tattoo removal outcome for you. Are there any times that you can’t remove a tattoo? These are known as contraindications and fortunately some are completely within your control. Implanted medical devices (such as pacemakers). You should consult your physician first and provide your renude clinician with a letter from your doctor at your initial consult. Please contact us if you have any concerns or other questions. We are here to help you. Can an old tattoo be faded before adding work? Many clients have chosen to fade old tattoos before getting new art. We can achieve the right level of fading in around half the number of treatments we would need for a full removal. The accuracy of our machine allows for precision work to recreate a design for you by your tattooist. So if your tattooist has some specific requirements get them to map it out on a photo of your tattoo and we can discuss your requirements at your complimentary consultation. The inks used in cosmetic tattoos often contain metallic bases which can behave unpredictably with laser removal. Instead of lightening the tattoo it can darken it. Contact us for a consultation as we consider these tattoo’s on a case-by-case basis. Do you remove breast cancer tattoos? Also known as radiation therapy target dot tattoos, these tattoos will be removed at no cost to any person that has had breast cancer. The target dot tattoo is as permanent as any other tattoo and can be an unwanted reminder. These small tattoos can be safely removed with a Q-switched laser, often only requiring two five minute treatments. Do you have male and female clinicians? Yes, we do. Please let us know when you schedule your appointment. Your privacy is very much our priority. All of our clinicians are fully educated, certified and experienced in the use of low level and Class 4 lasers. Dr Catherine MacInnes has been in the health care industry for over 25 years and leads a team of clinicians who have extensive experience in the use of lasers for tattoo removal as well as other forms of regenerative healing. You can choose renude laser tattoo removal clinic knowing that we are certified and trained with confidence. What’s covered in the initial free consultation? We conduct a skin analysis and discuss any medical conditions and your levels of exposure to the sun. We measure the area to be treated. We give you an accurate estimate of the number of treatments needed and the cost involved and discuss a treatment plan. We carefully explain the tattoo removal process and answer any questions you have, and if required or requested, we will help you implement health strategies to improve your outcome of clearance. We perform a spot laser treatment to ensure there is no skin reaction and that the most appropriate power setting has been chosen for good removal . While it is extremely unlikely that you would have a reaction to our state of the art laser machines, ensuring the best health outcomes for you is our primary goal. You approve the treatment plan and costs and we can book your first treatment. You can pay upfront and receive discounts or pay as you go. We can also help arrange interest free finance for your treatment plan. How should I care for my skin during laser tattoo removal? Your post treatment health plan is vital to the overall success of the laser tattoo removal process. Following our recommendations has a direct effect on how quickly your skin heals and its overall health. Avoid sun exposure prior to treatment! Come back to us two days after your tattoo removal session for the healing Low Level Laser Treatment (LLLT). There is NO HEAT, just healing light which increases oxygen supply to the area to speed up the healing process and provides antibacterial protection. Avoid sun exposure after treatment – the treated area should be covered for at least the first two weeks. After this, use a high SPF (50+) sunscreen. No heavy exercise for the first week and avoid heavy streams of water hitting the treated area. Avoid scratching or rubbing the area. Add lymph clearing foods to your diet. Use our At Home Care Pack: drink the Cleansing Tea, use the Healing Gel, and stay healthy. Can we remove all tattoo colours? The state of the art machine that we use has three independent wavelengths (see image below), a gold standard in the tattoo removal world, so the answer is yes in almost 100% of cases, except in the case of white. White is not officially a colour and it will reflect the laser light. This means that it will not respond to laser treatment. We will discuss the likely level of clearance with you during your free initial consultation. If your tattoo contains any layers of white ink, please ensure you let us know as this affects how we approach your tattoo removal treatment. If you had tattoo removal previously and noticed that a handpiece dye attachment was changed during a treatment, this is not an independent wavelength and at best, will only fade the tattoo rather than remove it. When a renude clinician changes the handpiece on the Quanta Q Plus C laser, it is to increase the accuracy of the laser beam through a different aperture (size) only. Do the lasers used in tattoo removal cause cancer? Non-ionising radiation such as laser therapy does not use the same wavelength as UV Sunlight. UV light is known to damage DNA in cells and promote cancer formation. In over 40 years of clinical care in the laser industry, there has not been a single case associating the use of lasers with cancer. Renude is Australia’s most advanced laser tattoo removal clinic. We offer an advanced multi-laser treatment protocol with special pre and post care that is backed by science. No other laser clinic in Australia includes pre and post Low Level Laser Therapy to improve your experience, achieving better clearance outcomes, with less pain and greater safety. We are experienced health professionals extensively trained and certified in the use of laser machines. Our goal is to achieve the best treatment outcomes for you and accordingly have invested in state of the art equipment that will provide this. Your privacy and confidence is guaranteed. We were sold on the science of tattoo removal, not the fancy sales pitch. We believe you will be too.